Recently I had the pleasure of photographing along the Central Coast of CA. While in CA a lot I hadnt been to this part of the state yet. Just so happened the trip coincided with the full moon so naturally my mind starts to line up ideas that could be possible. While we had been at the dunes earlier in the week the decision was to come back for sunset on our last night. Full moon rise right around sunset. While sunset was great (see previous post) the light was about to get crazy. There is a very small window of time, where the fading twilight starts to balance the brightness of the moon. It is in this brief window that I am now completely enraptured by. Nothing compares to the uniqueness of the colors that become possible. In the end I believe I was able to just take 3 photos before the light wasnt quite the same. This image I have two versions of, one cropped to make an interesting panorama. I am including both for your viewing. Which do you prefer?? 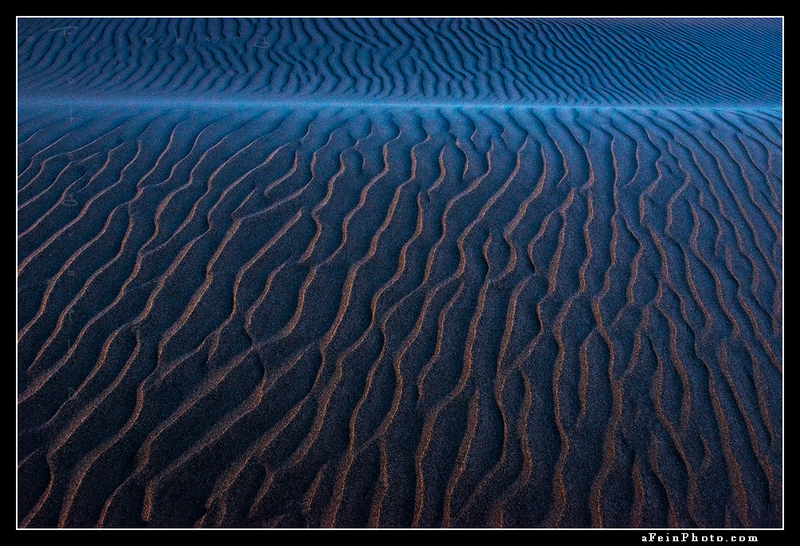 Posted in Image Discussion, Tales From The Road and tagged abstract, california, central coast, dunes, moonlight, twilight on March 28, 2017 by Aaron Feinberg. This particular day I was headed up from the south shore to the west side to go shoot sunset. At least that was the plan anyway. 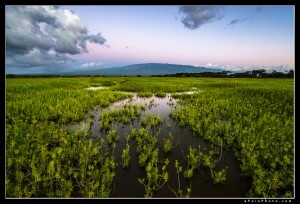 While heading out of North Kihei I looked in the rear view mirror to see Haleakela clear of clouds. Woah. All of a sudden I had a tough choice of trying to figure out where to shoot. I pulled over and debated a bit then hustled back to an area I had thought had a lot of potential. Careful exploring around it was difficult to settle on a composition I liked best. Always happens when I shoot a composition-rich area for the first time. Bouncing between two spots I spent well over an hour barefoot in the ankle deep water watching and shooting the change in light between sunset to nightfall. This particular image of the earth shadow rising behind the volcano caught me upon review. I’m always a sucker for those deep blues and magentas! 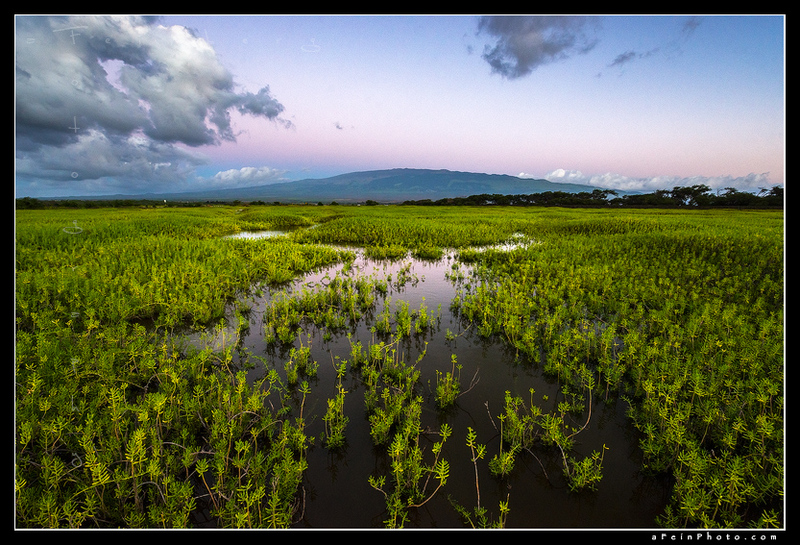 Posted in Image Discussion and tagged earth shadow, haleakela, hawaii, maui, twilight on November 2, 2015 by Aaron Feinberg. Twilight turns to darkness at the end of the road. 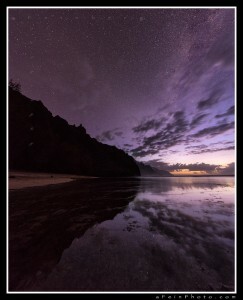 The Na Pali Coast reflects in to a still Ke’e Beach lagoon as the stars and Milky Way make their presence known. Magical. Posted in Image Discussion and tagged hawaii, kauai, Ke'e beach, milky way, reflection, stars, twilight on November 24, 2014 November 25, 2014 by Aaron Feinberg. Had a chance to shoot at Ke’e one last time in which this VERY temporary beach existed. In the 6+ years of living on Kauai I have never seen that much sand at the end of the summer at this spot. But perhaps I just hadn’t looked before. Either way this captivated me and spent a number of sunsets here. This being the most recent. As the sky was clear, again, my mind turns to twilight and that wonderful transition of light. The last bit of sunset fades away and gives way to the stars. Our visiting friend Venus (I think) made for quite a show as well! 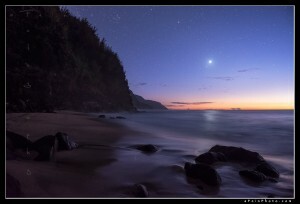 Posted in Image Discussion, Tales From The Road and tagged hawaii, kauai, Ke'e beach, na pali, stars, sunset, twilight on October 9, 2013 by Aaron Feinberg. So many stories surrounding this image. Of which include; powering through a month-old knee injury, getting a bit lost and then un-lost, ‘no fall’ zone hiking, fellow hikers lending me their trekking pole for the night and spending hours alone in the dark in a cave to then hike out in the dark, alone. Of course returning with a successful image always makes those details worth while when the effort is rewarded. This location, on the edge of a cliff, tucked in to a cave, was used hundreds of years ago by the Anasazi Indians, though the details and usage are still unknown. Being as I was out there, with a very clear sky, my instinct turns to photographing the stars. It’s amazing how much light cameras can pick up nowadays. 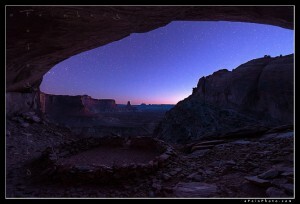 Watching the nocturnal transition from such a remote location, one cant help but be transported back to ancient times. Chills. And then for that very dark walk back to the car…. Posted in Image Discussion and tagged false kiva, night, remote, stars, twilight, utah on May 23, 2013 by Aaron Feinberg.